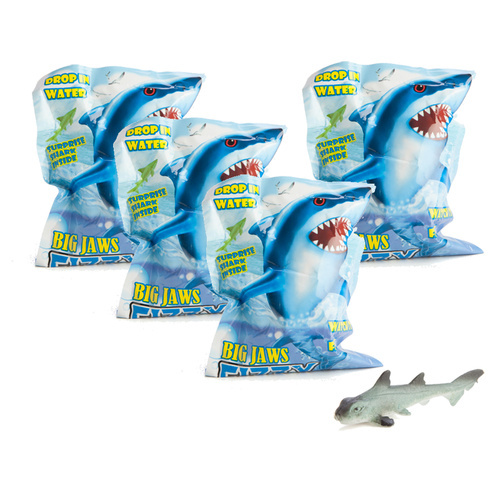 Big Jaws Fizzy Shark 4 Pack | Drop them in water, watch them fizz! Drop them in water, watch them fizz! Great stocking fillers or party bag favours! Drop your egg shaped fizz bombs into water and transform them into something exciting! Whizz, pop, fizz! Your Big Jaws Fizzy Sharks go off in water as if it they are loaded with mini fireworks! Watch and experience the miraculous birth of 4 cool sharks for you to collect. Buy now and save! You won't know which sharks you will receive until the fizz bombs dissolve. Add one to your bath for some extra magic! Please note: We cannot guarantee that you will receive 4 different designs as we cannot tell what is inside - each one is blind packed. You will receive: 4 x Big Jaws Fizzy Shark. There are 6 unique shark characters to collect. Packaged dimensions: 10cm (l) x 3cm (w) x 14cm (h).